There isn’t a rhyme or reason for why any right or wrong occurs in a person’s life. Sometimes you make the right choice and take the win. Other times you find that the dealer has the advantage and even with your best intentions, the house takes the pot. Each day brings a new set of challenges, and there are never any easy answers. More often than not, I’m just happy to come out even. In my 19,000+ days on this planet, I’ve had some tough times, and I’ve had some great successes. This year goes down in the history books as one of those winners: My health is good. My kids are strong. My marriage is blessed. My house is still standing. I can honestly say that within my lifetime, I’ve seen some inspiring and jaw-dropping sites; like Masada in Israel, the Vatican Museums at night, and Paris in the morning. I’ve stood at the edge of the Grand Canyon. I’ve stood in the rain and fog of the Smokey Mountains, and I’ve basked in a dry, crystal-clear Arizona sunset. I’ve watched waves lap up on the Mediterranian, Atlantic, and Pacific shores. I’ve counted hundreds of birds over three continents and most exciting of all, witnessed half-a-dozen California Condors flying across the skies of Utah. But for all the moving sites I’ve seen and the places I’ve been, perhaps best of all, time with my family right here at home has been more meaningful than anything. I love having adult children…and better yet, I love our adult children. Our kids are witty, loving, and gentle. They enjoy one another and any time with them is a gift. Don’t tell them this, but my wife and I are loving the empty nest phase of life. Without worrying about a sitter, we can pick up and go to a movie, for a walk, out to eat, or on a drive whenever we want, no questions asked. So far, the past 53 years have been pretty fantastic. They haven’t been perfect; no year is. But there isn’t much about these 19,000 days that I would trade. I drove from my home a short distance of 4.8 miles. It took me less than 10-minutes. In the time it took to listen to a song from the soundtrack from the movie Chef, I’d parked my car and was pushing a cart in the produce section. I found a box of fire-logs and a whole chicken. I added bananas and a box of cereal to the cart. Within a few short minutes and after walking down a few short aisles, I had everything I needed…and probably a lot more. I so very grateful for grocery stores. And I often take this convenience for granted. I realize there are people around this small planet who do not have this luxury. They walk miles for fresh water. If they’re lucky, they eat rice and beans for every meal of every day. And so as I placed my various items on the conveyor belt today, I said a prayer of thanks but this wonder is available. For grocery stores close to my home and for food in abundance, I am grateful. I have a thing for clocks. You can ask my wife. You can question my daughter. My sons will fill you in on the truth. I love a good clock. The louder it ticks, the happier I am. The greater the ring of the chime, the more joy I experience. Over the years I’ve gathered a coo coo clock from the Black Forest of Germany, and added a beautiful banker’s clock in my office, and my best timepiece is a work shop ticker made from a circular saw blade. The traditional clocks require attention and maintenance if they are to fulfill their purpose. They need regular winding. They need dusting. In short, they need a little love on a daily basis. So, you can imagine my chagrin when I discovered the clocks were all stopped. No ticks. No tocks. No magical hourly chimes. The most troubling revelation came when I started counting back the days to when I’d last wound the spring and pulled the chain. More than a week had passed and the clocks paid the price of my negligence. Most distressing of all, I realized that my desire to succeed at work, move my job to the next level and prove myself to my company and my co-workers, took every spare minute of my time. Early mornings. Late nights. Weekends. Work and more work. Every spare hour was used to get the job done and yet, there was always more to do and never enough time to get it done. Ironically, my lack of time resulted in my inability to accurately keep my time keepers functioning fully. And if the clocks on the wall suffered because of my out-of-control work schedule, packed to the rim and painfully full, what else declined in my business and distraction? Did I fail to love my family well, just as I failed to tighten the springs on the Banker’s Clock? Did I fail to listen intently, just as I failed to pull the chain and weight on the coo coo? My need to make the most of every minute to move my career forward resulted in the loss of the most precious commodity of all: Time dedicated to those things that matter even more. Today I wound the clocks for the first time in weeks. While I can’t turn back time, or regain that which is lost, I can certainly count every minute moving forward, making the most of every precious and fleeting second that remains. When it comes to books, the not-so-classic “Forest Gump” is one of the oddest pieces of literature I’ve ever read. If you are looking for something to read this summer, I do not recommend it…and not just this summer, but ever. On the other hand, the movie has become a classic; a cultural icon in which the main character engages in many famous, and some infamous moments in modern history and includes the now familiar lines, “Run, Forest! Run!” and “We go together like peas and carrots.” And of course everyone’s favorite, “Life is like a box of chocolates…”. 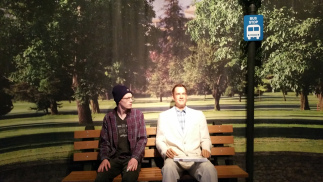 My son, Benjamin, sits beside a wax figure of Forest Gump in Gatlinburg Tennessee, 2015. But beyond the pithy sayings, and the journey through time, I enjoyed more than anything else the creative device the film makers use to tell Forest’s tale: As the main character awaits his city bus, he retells his life’s story to every unwitting stranger who shares his bench. It’s a fascinating narrative and if anyone had taken the time to wait the day, they might have heard the entire account. As it was, each person only gets a quick glimpse into Forest’s life and by itself, each section of the fascinating yarn might make no sense at all. However, in total it is a chronicle that illustrates a life of perfect timing, blind luck, high adventure, and faithful dedication to one true love. I can’t help but wonder how many people in my own life could have shared their entire story, but I climbed into the departing bus before I could hear it all. It’s likely I lost interest part way through and walked away from the story of a lifetime. Is it possible that I heard only the unbelievable portion and failed to grasp the entire moving saga of a life well-lived, a love fully given, a grace perfectly extended? When did you last you take the time to listen to a bus stop story all the way to the story-book end? This is a question that has been asked for centuries. Typically, it is ended with “by the rest of the animals”, but I have a different ending to that age-old question. I would ask, What separates the humans from other humans? As it turns out, it can be something as little as a nylon strap. While flying American’s friendly skies recently, I witnessed what has become a common occurrence. If you’ve traveled via means of the airlines at all, you know what I’m talking about.